It’s funny how most people have certain ideas about creativity. If we only knew, it’s tragic how many of us have wrong ideas about how to find, cultivate and assert creativity in their lives, businesses or organizations. Here’s an example: how many times have we been called by a superior, put into a room together and ordered to brainstorm solutions to a particular problem? The belief is that by generating as many ideas as possible together in a short time, a workable idea can emerge from that ether. As it turns out, the concept of brainstorming may be a myth altogether, argues the author of a new book about creativity. 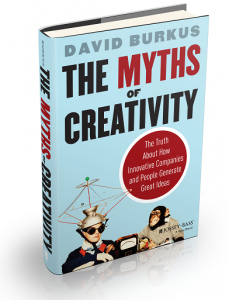 The book in question, “The Myths of Creativity: The Truth About How Innovative Companies and People Generate Great Ideas” by David Burkus, looks at the common misconceptions that surround creativity and innovation. Burkus is assistant professor of management at the College of Business at Oral Roberts University, where he teaches courses on creativity, innovation, entrepreneurship and organizational behavior, and in “The Myths of Creativity” he brings together his insights to try and debunk what he believes are the ten key myths that surround that elusive quality called creativity. Take the ‘Eureka Myth’, for example. It’s the notion that all creative ideas come from a sudden flash of inspiration, as though the months and years of focus before or the hard work that comes after had no implication on the final, implementable idea. There’s also the Originality Myth, where we believe that each new idea is the culminated result of one single individual’s mind or effort, that faulty belief that it’s wholly original and hence should be accorded full intellectual property rights. Or what about the Brainstorming Myth previously alluded to, where some purport that inspiration conforms to the tired formula of assembling people in the same room and encouraged to work on possible solutions for a problem? Creativity, after all, should be more than simple rapid idea generation. Burkus highlights a total of ten of such myths, covering each one of them in their own chapter. For some of them he highlights various research studies and cutting examples to debunk those myths – as a craft beer enthusiast I was heartened to read about how Boston Beer Company, the brewer of the popular Samuel Adams Boston Lager, on how the recipe was developed – suffice to say, it wasn’t from sitting in a room with a bunch of people discussing ideas. If you’re looking to inject some creativity into your company or organization, “The Myths of Creativity” is a good reference. It tells you where the common pitfalls are when it comes to thinking about creativity, and can hint into the areas of improvement when thinking about how you can come up with the next big idea.